Preheat oven to 400º. Spray a mini muffin tin with non stick cooking spray and set aside. On an lightly floured workspace roll each biscuit out very thin, and trim into a square (approximately 4-inches). Cut the square into 4 equal squares. Lightly press dough into each opening in the muffin tin. Divide shredded cheese evenly between each mini cup. 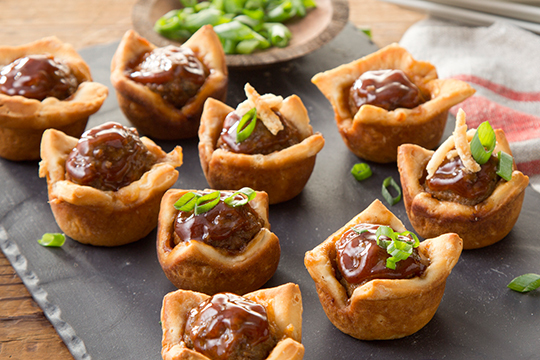 Toss meatballs in ¼ cup BBQ sauce and press one meatball lightly into the dough of each opening. Bake for 8 minutes, then rotate the pan and bake for an additional 4 minutes, or until the biscuit dough is golden brown. To serve, remove from muffin tin, top with a dollop of remaining BBQ sauce and garnish with fried onions and scallions.